decent options for casino camping. 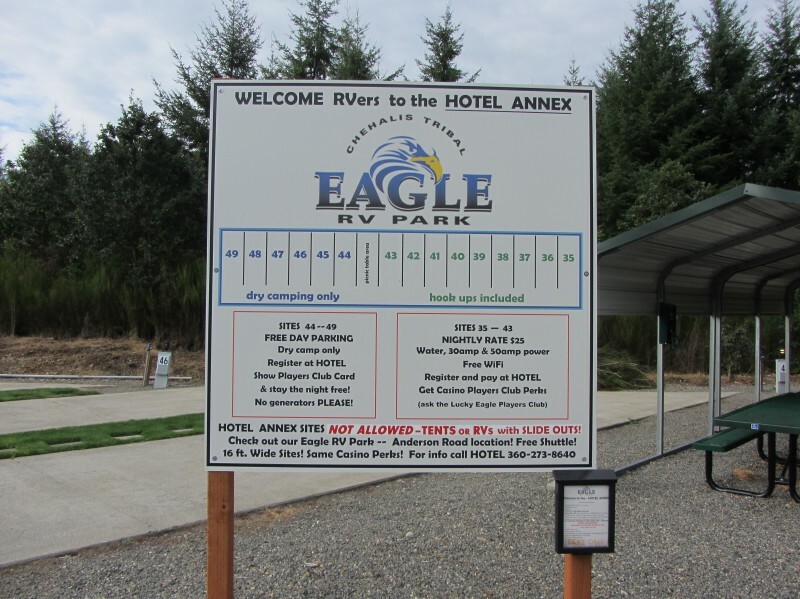 Lucky Eagle has three options for spending the night. 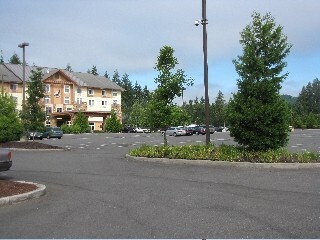 They have a small area at the back of the casino parking lot where you can park. They allow but don't encourage parking there. Second, is across the street at the hotel. As Retiredguy posted in Winter 2016 they have about 12 spaces that offer water and electric. The spaces are narrow with almost no space between spots. You are not allowed to extend your slide. These spaces cost $25.00 per night. These spots are close to the casino. They include easy access to the laundromat (down the hall from the front desk), pool, and discount at Starbucks. 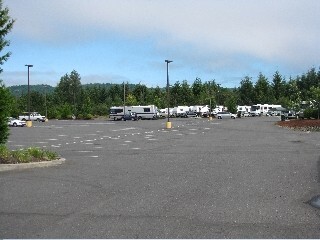 Third, is a parking lot camp about 1 mile away on Highway 12 across the street from their store. You can call for a shuttle or drive over. If you want to bicycle the road is well paved and fairly wide. These spots are nicer than the ones by the hotel. They do offer sewer as well as electric and water. These spaces are wide enough that you are allowed to put out your slide. These are RV spaces and not camping spaces. They do not allow fires. The biggest negatives are: as with most any casino rv space it is just a nice parking lot. The other bad is it is right on Highway 12 so there is some traffic noise. Across the street is the tribe gas station and store. When I was there last, August 2018, the gas prices were very low. I jumped at the chance to fill up with diesel and propane. Where just about everywhere else was charging $3.49 for propane they were charging $1.99. A good spot but a few miles off I-5. They have around 12 spots right at hotel parking lot beside casino. 6 are dry camp, 6 with hookups. We dry camped both times, way down and way back. It was free but still got to use WIFI and facilities. There is also a RV site for casino at turn off from Hwy, about 1.5 miles away. Minimal facilities but that's OK as its just a stop over. Casino was fine, food average. Wow this was a very pleasant surprise. This was my first casino overnight after having just come from getting solar panels installed on my trailer. Pulled in about 10:30pm. RV area was maybe 1/3 full. Backed not a dry spot, went to the hotel desk. They keyed in my information in their computer and I was done. Very quiet, astonishingly fast (8-9mbs) wireless speeds in the RV area, inside my Airstream. Only got PBS on the batwing antenna. We "camped" in a power and water hook-up spot but there are spots that are 'dry camping'. The sign says the dry camping area is free, but see below... We registered at the hotel front desk and paid the $25.00 for one night. Then we went into the casino, which is across the quiet street, and signed up for the player's club. We got a coupon good for 25% off dinner and (for us) $5 worth of slots play. We gave them $20 and they gave us a $25 'receipt' to us in the machines. We also showed them our receipt for the $25 camping and they refunded us the $25 in cash!! Overall it seem pleasant enough, quiet and everyone is friendly. The spots are quite narrow and you are not supposed to have your slides out. We did for a short time while we were in the rig because we need them out to get around in the rig, but it would be a problem if the spots were busy. 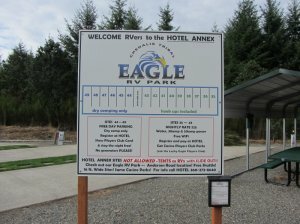 There are two RV areas and it costs $25 a night. Both areas are serviced by a shuttle. Register at the hotel. We like this casino and it's only about 15 minutes of I-5. We see some RV's in the hotel parking lot but not sure if it's still cool to park there overnight for free.